EACH PENDANT IS CUSTOM MADE TO ORDER AND PERSONALIZED WITH YOUR NAME! Please include the spelling of the name in the notes to seller section of your order. 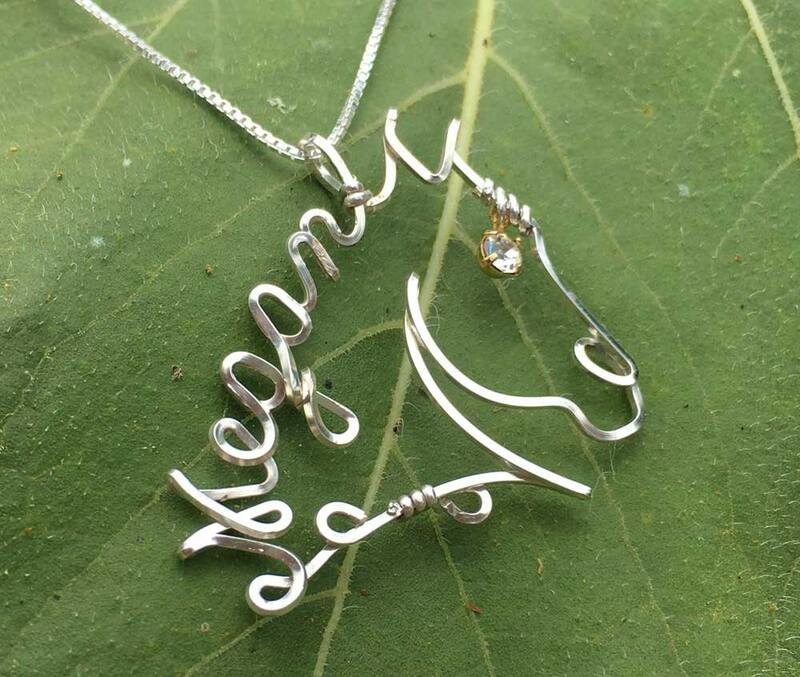 Adorable Horse Pendant. Includes Figaro chain 16" or 18". Fine handcrafted jewelry made from a single continuous strand of 12k gold wire or Sterling Silver! We hand craft these unique and adorable Horse Head Pendants especially for you with any name you choose. 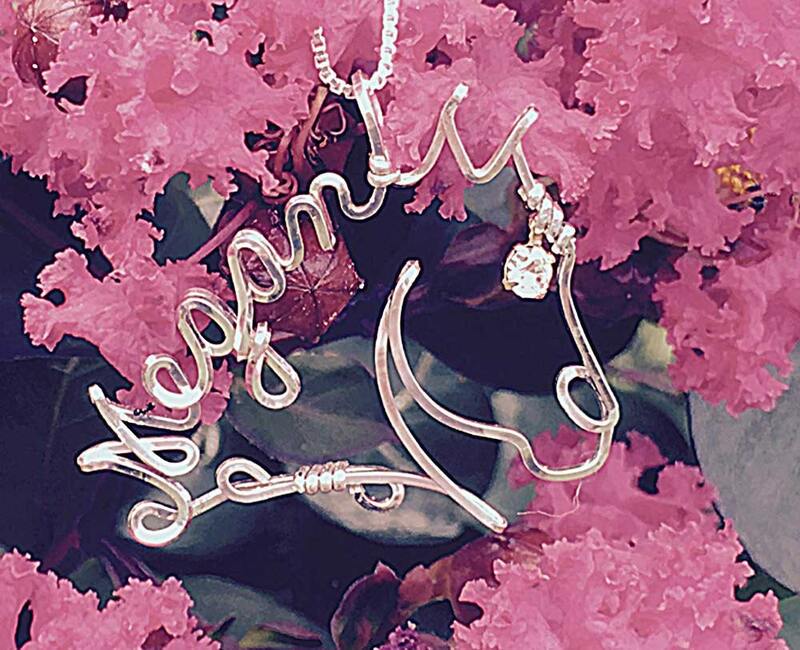 personalized jewelry, now's your chance. Includes 16" or 18" 14k gold filled chain or sterling silver figaro chain. Maximum 9 letters. Nothing says I love you like a custom made personalized gift!! Great gift item for any Horse Lover on your list. Policies Payment We accept credit cards through Etsy's Direct Checkout and PayPal as our methods of payment. An account is not required to pay by check, debit or credit card through PayPal. Payment in full must be received and cleared before orders are filled or shipped. Please note that if you choose to use an E-check through PayPal it can delay creation and shipment of your piece by as much as one to two full weeks. PayPal will not allow shipment until all money is deemed cleared by them. The shipping times given do NOT include production time for custom items. Please understand that if you are ordering an item that is handmade it does take time first to make the custom request. If you are in a hurry and need the piece quicker than the estimated "ship by" date please call me at 918 786-3996 or send a message through Etsy about it and I will do my best to work with you. PLEASE NOTE: We cannot be responsible for packages stolen from your address after they have been marked as delivered by the Post Office. We will try to help you resolve this by opening a case with the USPS on your behalf, but you will most likely have to speak to your local postmaster and file a local police report for mail theft. I accept refunds or exchanges on certain items provided the buyer contacts me within 7 days of receiving the items and they are returned to me unworn in their original packages and postmarked within one week of receiving the item. Buyer is responsible for return shipping costs unless the fault lies with us. Shipping fees are non refundable. *Custom pieces made in your size, with your choices, or personalized for you. *Custom hand stamped pieces. This includes team numbers, phrases, names and words. Many countries also impose VATs, taxes or duties. It is the buyers responsibility to determine what these fees will be and pay them. We are in no way accountable for any fees your country imposes. Any package refused and sent back because of said fees will not be given a refund. Please do NOT ask us to write GIFT on your package. It is illegal to do so even if it is a gift from you to another person. If it has been purchased from us that makes it merchandise and it must be sent as such. To do otherwise could cause us to lose our business license and suffer fines and/or jail time. Thank you for your kind understanding in this regard. Please make sure your address is correctly entered when making your purchase. Items eligible for refunds returned to me marked undeliverable-as-addressed will be charged a 30% restocking fee to cover materials and return postage or a minimum of the costs incurred by me. Original postage fees are non-refundable. If the item you ordered is considered "custom" (it is made in your size, with your choices you requested, or personalized for you), this means the item is not returnable under the European Union Directive on Consumer Rights, right of return. This right does not extend to custom-made products and certain perishable goods, unless otherwise specified by the seller. Also there are no refunds on shipping costs once mailed. Once the item arrives in many cases your local post office will hold it for collection of VATs. Please check with your local post office in a timely manner to see if the item might need to be picked up. Properly cared for jewelry made from precious metals will last for generations to come. Please keep delicate items in their own box, away from heavy pieces that could damage them. Use the correct cleaning products to care for each piece. Stamped words and phrases or stamped pieces customized in various ways are non-refundable. Please also note that stamping is done completely by hand. You will see variations in stamped pieces like lettering not lined up perfectly. This is the nature of handmade and is not considered a flaw; rather it adds a unique character to a piece. Please do not ask for word jewelry containing profanity or blasphemy. The transaction will be canceled. Policies Refunds It is my goal to have you as a return customer. If there is a problem with your purchase, I will do my best to satisfy your concern. If there is a problem with the construction, I will replace your purchase. If you choose the wrong size I will do my best to re size without additional expense to you. We cannot fix a problem we don't know about so PLEASE let us know if your purchase does not meet your expectations. Additional Info My personal warranty does not protect your purchase from loss by the post office. You have the option to purchase insurance. I welcome your Custom Requests and hope you will give me the opportunity to create your Special Jewelry Item.